Giannis Antetokounmpo finishes with a career playoff high 41 points as the Bucks complete a series sweep over the Detroit Pistons. Check out the Top 5 plays from this playoff Monday in the NBA. Tom Thibodeau and the NBA TV analysts break down who they expect to take the Bucks and Celtics series. Giannis Antetokounmpo pours in 41 points and adds nine boards as Milwaukee completes the sweep against Detroit. From beginning to play basketball in Greece at the age of 12, to becoming a leader of the Bucks, here is Giannis Antetokounmpo‘s journey to the NBA. Bucks take a 3-0 series lead as the Pistons suffer their 13th straight playoff loss, tied for the worst in NBA history. 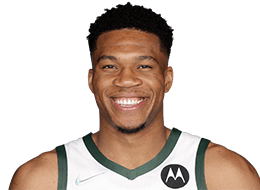 Averaged 6.8 points, 4.4 rebounds, 1.9 assists, 0.8 steals and 0.8 blocks in 77 appearances during his rookie season ... ranked among the NBA’s rookie leaders in scoring (11th), rebounding (T-4th), assists (T-10th), FG% (9th), 3P% (4th), FT% (9th), steals (6th), blocks (4th) and minutes (5th) ... scored in double figures 23 times and grabbed 10+ rebounds twice, with both efforts resulting in double-doubles ... led the Bucks in blocked shots on 22 occasions, second on the team behind John Henson’s 40 such games ... finished the season with 61 total blocks, which led all NBA rookies and was the seventh-most by a Bucks rookie in franchise history ... posted the first double-digit scoring game of his career with 11 points on 11/12 at MIA ... made the first of his 23 starts on 12/18 vs. NYK and finished with 10 points and seven rebounds ... recorded his first NBA double-double on 12/27 at BKN with a season-high 16 points and 10 rebounds ... recorded his second double-double on 1/11 at OKC with 13 points and season-high-tying 11 rebounds ... selected to participate in the BBVA Compass Rising Stars Challenge at NBA All-Star Weekend in New Orleans, where he tallied nine points, two rebounds and two assists in 17 minutes. 2014 NBA Summer League: Played in four games (four starts) and averaged 17.0 points, 5.8 rebounds and 1.8 assists in 32.5 minutes per game ... missed the fifth game due to obligations to the Greek National Team ... scored in double figures three of his four games with a high of 20 points against the Spurs on 7/16. 2014 FIBA World Cup: Averaged 6.3 points, 4.3 rebounds and 0.3 assists in 16.0 minutes for his native Greece ... posted highs of 15 points against Puerto Rico, and 6 rebounds against the Phillipines and Argentina ... 2013 U20 European Championships: Played in 10 games for Greece’s U20 National Team and averaged 8.0 points, 7.6 rebounds and 2.2 assists ... ranked second for the tournament in defensive rebounds (7.0) and seventh in blocked shots (1.4) ... Greece finished the tournament in fifth place with an 8-2 record ... 2012-13: Played in 26 games for Filathlitikos AO (A2, second division) and averaged 9.5 points, 5.0 rebounds and 1.4 assists ... shot 62.1% from 2-point field goal range ... selected to play in the Greek League All-Star Game and scored 8 points ... grabbed a season-high 10 rebounds vs. GS Laviro on 2/23 ... posted a career-high 23 points vs. Irakleuo Crete on 3/2 ... had 13 points, 7 rebounds and a season-high 4 blocks vs. Ermis Lagkada on 4/13. Selected by the Milwaukee Bucks with the 15th overall pick in the NBA Draft on 6/27/13 ... signed his first NBA contract with Milwaukee on 7/30/13. Born in Athens ... parents immigrated to Greece from Nigeria ... has four brothers, two older (Thanasis and Andreas) and two younger (Kostas and Alexandros), who also play basketball ... made the most of time in Milwaukee the summer of his rookie year with visits to the Wisconsin State Fair and Palermo’s Pizza Factory, where he received a personal tour of the facility from the Fallucca family and was able to make and eat his own pizza ... on Twitter as @G_ante34.